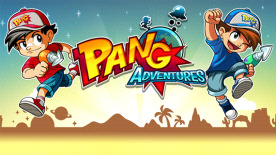 The Pang series is a beloved collection of arcade video games from the early 90s. Guide two brothers on a quest around the world to save humankind from a massive alien invasion! Use your wits and skills to overcome the attack balls pouring from the skies and rescue the world's cities and landmarks from impending annihilation! ● The Pang Bros. have upgraded their gear since the last alien invasion: machine guns, flamethrowers, lasers, shurikens...you name it, they've got it! ● Boss fights! For the first time in the series, the Pang Brothers come face-to-face with the nefarious Alien Commanders! These villains didn't come to Earth for the sightseeing...so get ready to blow them to smithereens!